Here we are again, pushing towards the end of another year. And here I am, again, surrounded by 12 new issues of Martha Stewart Living magazine, pushing my bookshelves to the limit. Below is my annual review for 2011. I know a lot of you enjoy reading this review so I try to make it as insightful as possible. This time I am going to tackle it a little differently. I will highlight the best in a few categories: best issue, best cover and best photo spread. For the best issue of the year I base my decision on these criteria: the originality of the content, the beauty of the presentation (photography) and the vitality with which the magazine celebrates the season in question. First, though, let’s look at some of the changes that took place at the magazine in 2011. So far I have enjoyed Pilar’s contributions to the magazine. They are not blatantly obvious, but they are visible. Here are some of the changes I've noticed since her arrival. 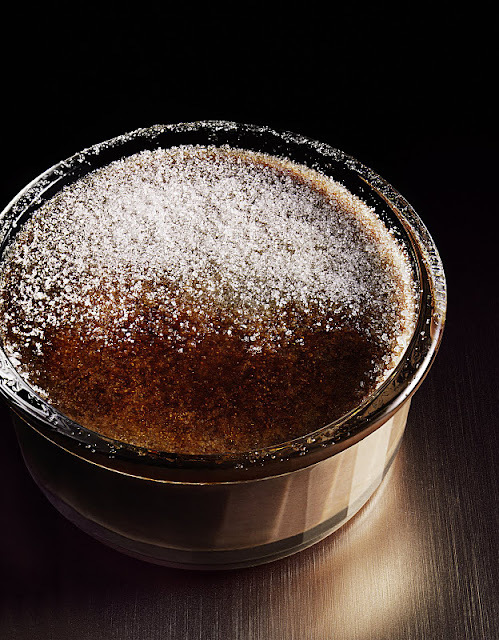 b) The introduction of new column categories, such as Traditions. c) The replacement of the To Make and Give column on the last page with a monthly essay from a freelance contributor, which I find very refreshing. It's nice to end your read on a human note: insights, thoughts and reflections. It reminds me a bit of Martha's Remembering column. The most significant change brought by Pilar, however, is the consistent recurrence of themes like children, family and togetherness. 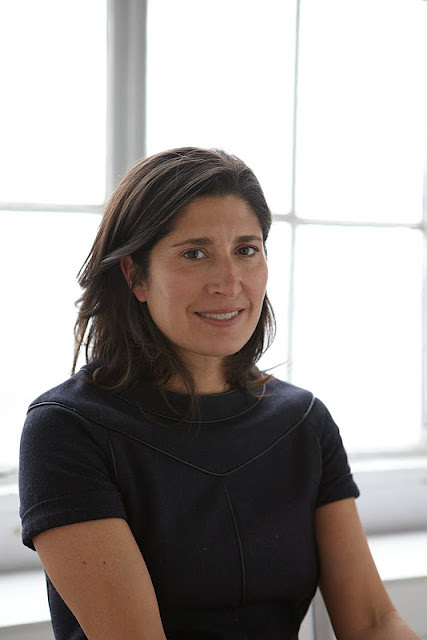 Pilar’s editorial (and personal) interest in family and children has been apparent in many issues of the magazine since she took the helm, particularly visible through an increase in the number of photographs that depict children and families in the various stories, but also through content: crafts for children, memory-keeping, etc. I have absolutely no confirmation that this blog inspired the column, but I like to think it did at least play a subconscious role in its naming. In it, Martha would share a moment in her world through one of her photographs (tomatoes from her garden, a snowy scene on the farm, her pets, her peonies) accompanied by a brief description written by Martha. It was a nice little page and I looked forward to it every month. Seeing the world through Martha’s lens is always a treat. The column was cut in the September issue, however, but it was nice while it lasted. Martha's Calendar was replaced in January, 2011, with Martha's Month. It was a mixture of the calendar with gentle reminders, various tips and techniques. 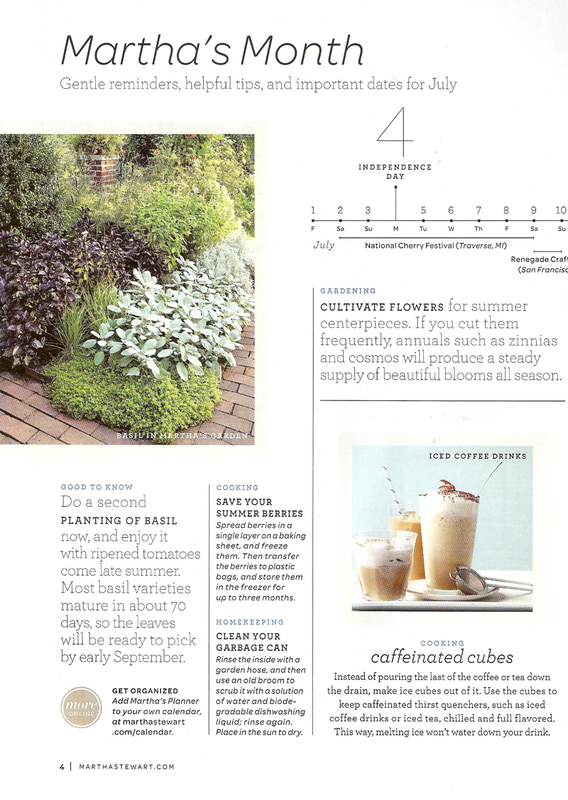 Many readers were not pleased with the layout and a year later the grid-calendar format is back. The table of contents pages also received a facelift in 2011. I like the simplicity and airiness of the new layout. 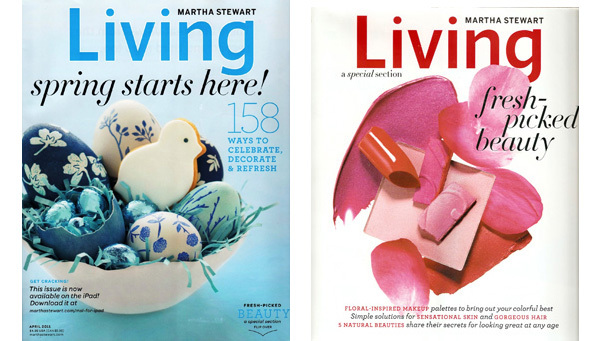 As in previous years, there were several issues of Martha Stewart Living that were released with double covers in 2011. Below is a gallery. March had two covers. The one on the right had very limited distribution on newsstands. October also had two covers. 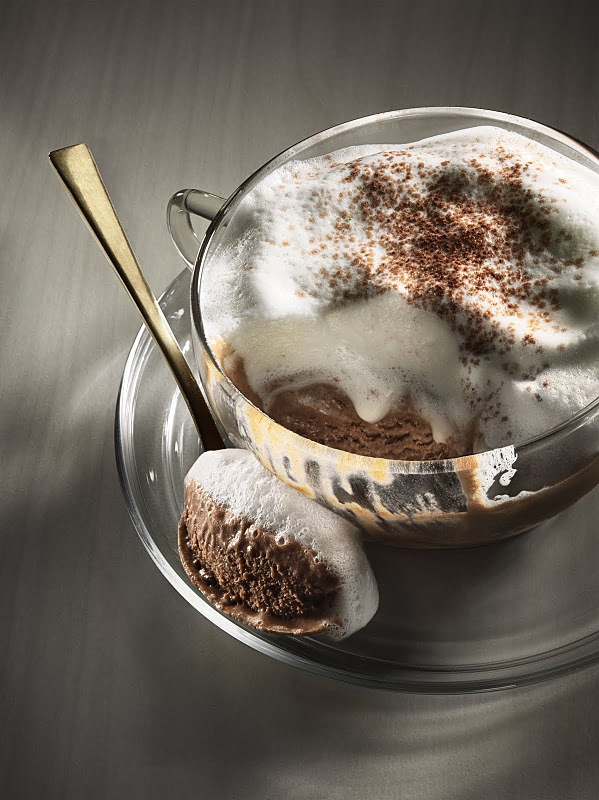 The editors asked readers to vote on their favourite. The one on the left won out, arriving on newsstands and to subscribers. The cover on the right was released but only in certain parts of the United States. If you find either of these two alternate covers for March or October, consider yourself a skillful treasure hunter! 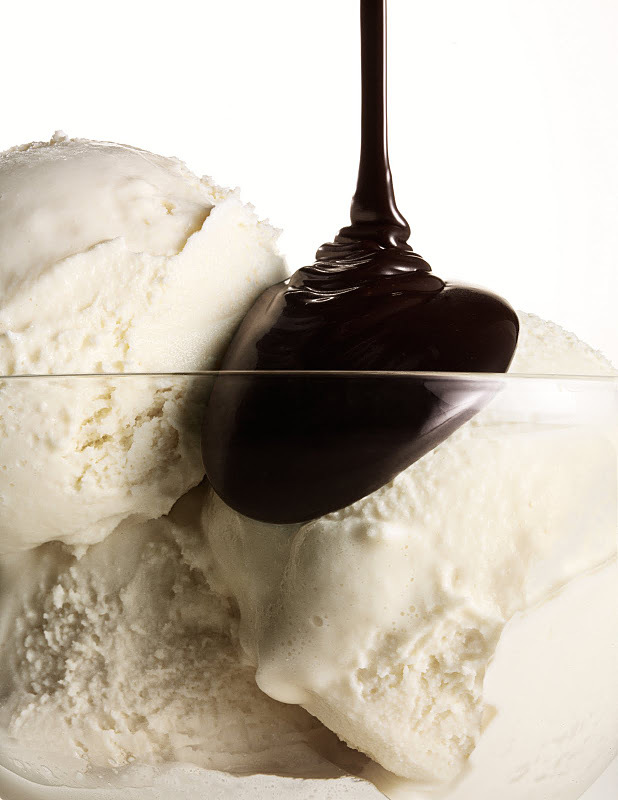 In November the editors released two variations on the same cover. The cover on the left was sent to subscribers. The cover on the right was available on newsstands. 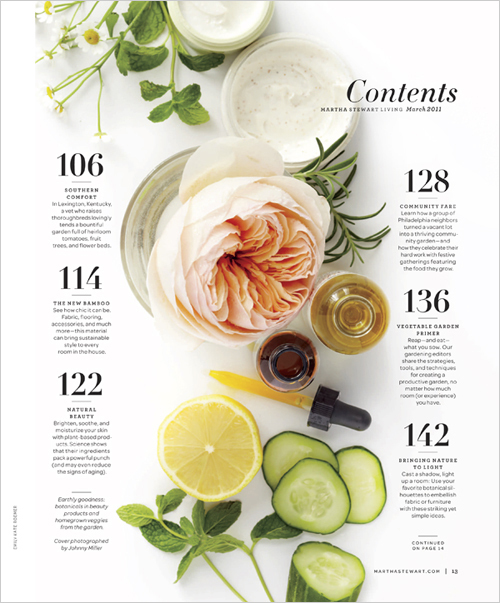 The April issue had a special beauty feature at the back of the magazine, introduced by a separate back-front cover. The section and the cover were printed upside down to distinguish the content, which was mostly just glorified advertising for cosmetics. For the first time ever, Everyday Food published a special issue in a full-size format, with content based on summer foods. It is a gorgeous issue with incredible photography. 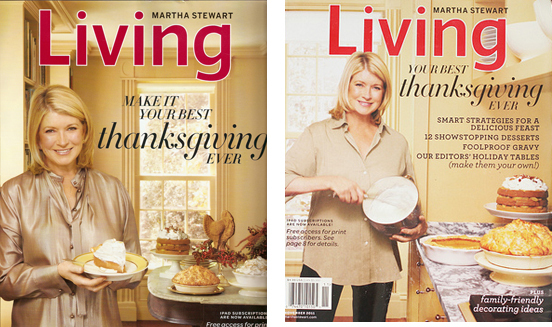 Martha Stewart Living published two special issues: a Halloween publication and a Holiday issue. Both of these are more or less ‘best of’ issues with previously-published content, balanced with some new content. Still worth collecting. Okay, folks, here we go. It’s time to pick the best issue of the year! This year, for the first time since writing this annual roundup, it was the summer issues that most impressed me. I have stated before that I generally am not as fond of the summer issues of Martha Stewart Living. Perhaps it has something to do with lifestyle: I’m out a lot more in the summer and don’t spend a lot of time with magazines of any kind. 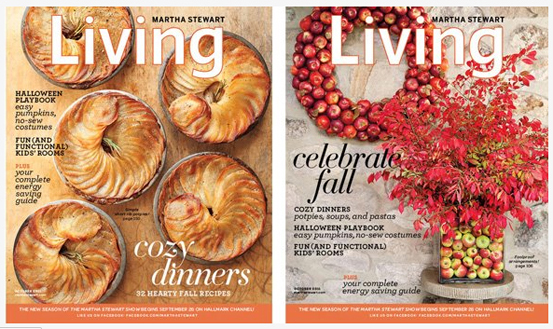 The fall issues, with their emphasis on décor, baking, holidays and crafts are usually more engaging for me. This year, though, I found myself repeatedly drawn to all of the summer issues: June, July and August. Each of them excited me. 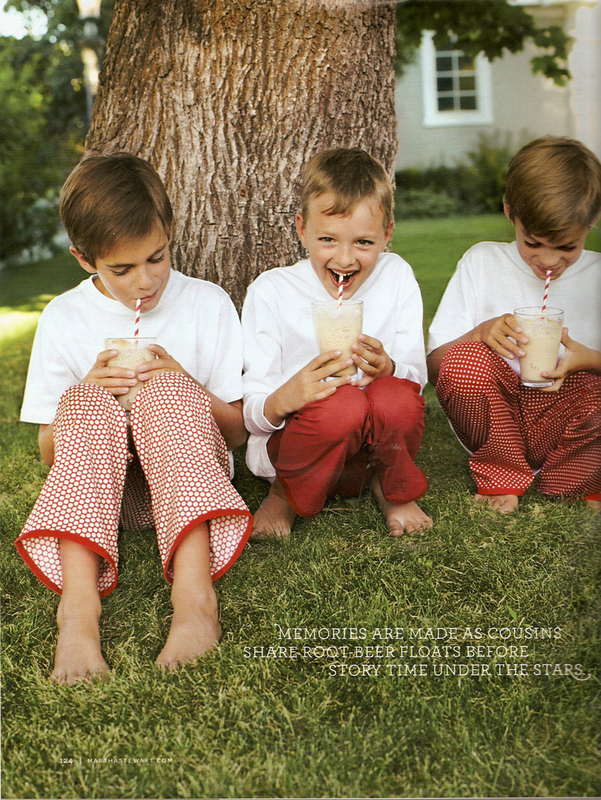 Because they were able to snag my interest beyond a casual glance for the first time in the history of my love affair with Martha Stewart Living, I give each of the summer issues a gold star. That’s right. They are ALL tied for first. I simply couldn’t pick one. b) There was a seamless and perfect blend of each of the lifestyle categories in each of the summer issues: food, crafts, gardening, decorating. c) There was lots of originality and creativity in these issues: the editors had clearly pushed the boundaries and were thinking outside the box in every single category. d) The photography was stunning with so much colour and vitality, particularly because of the use of people in so many of the editorial spreads: people eating, people playing, people enjoying the season. It was inspiring. Below are some of the summer highlights. Kids and families figured heavily in the summer issues. It was nice to see. 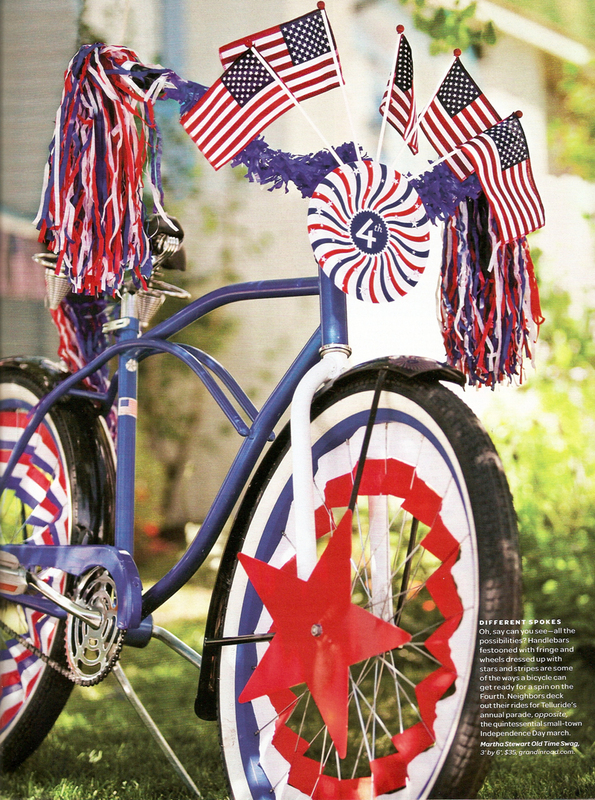 A really inspired story on Fourth of July decorating in the July issue. 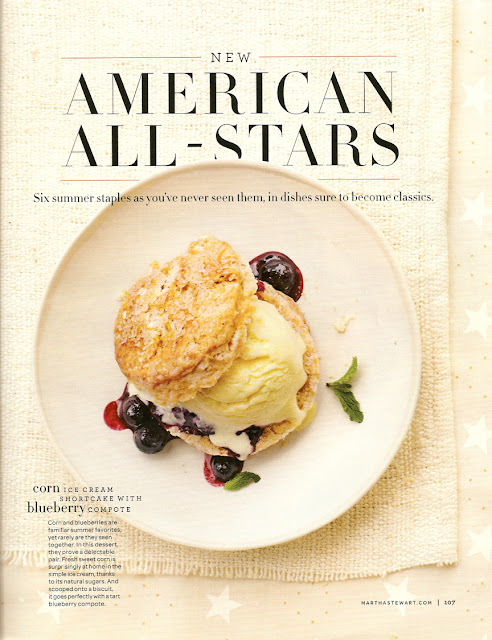 New American All-Stars: American summer classics reinvented and reimagined. 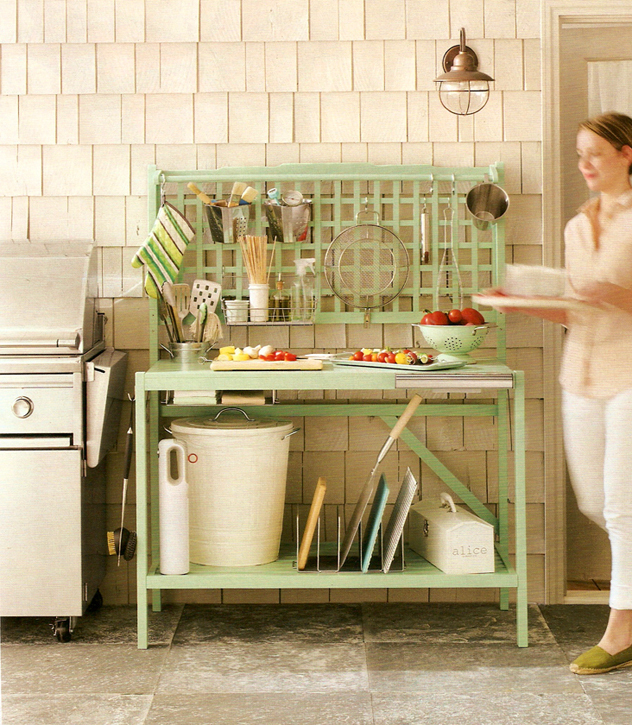 A brilliant idea: turning a potting bench into a summer grilling station. Bandana crafts that stretched well beyond the expected. 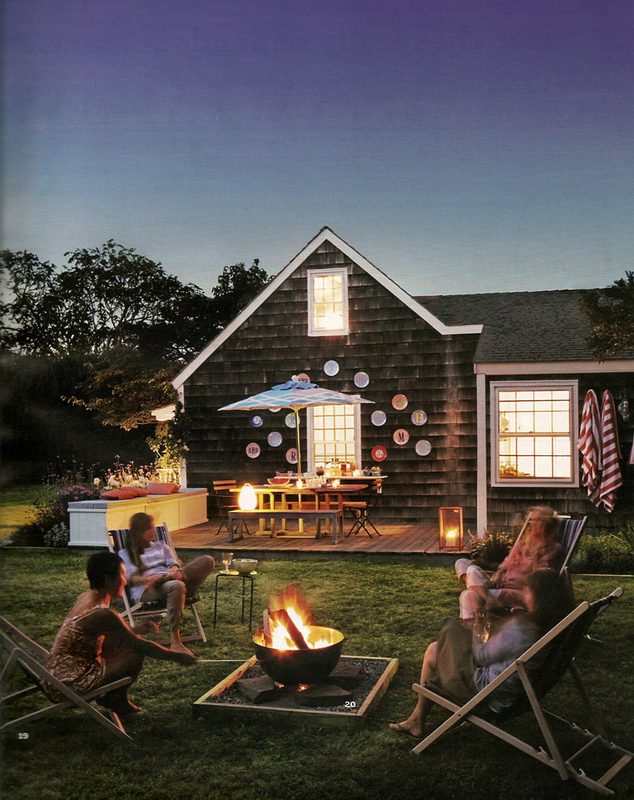 Tips on how to summerize your home outdoors. 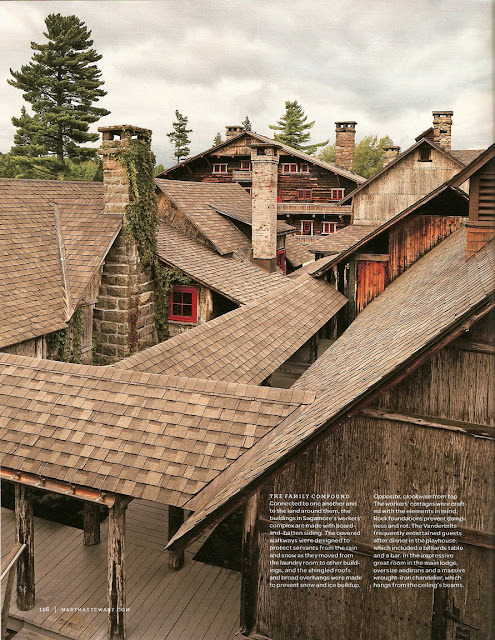 I loved this in-depth article about Great Camp Sagamore in upstate New York in the July issue. 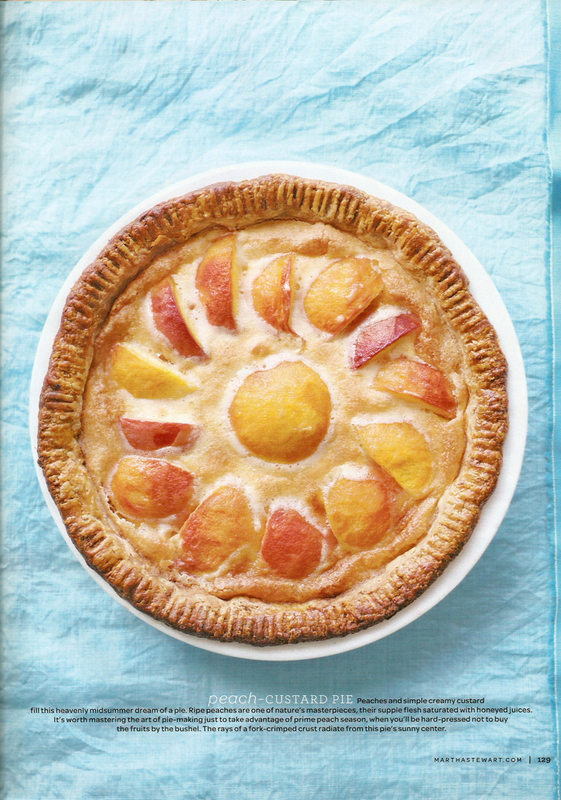 Delicious summer pies in the June issue use the best in seasonal produce. 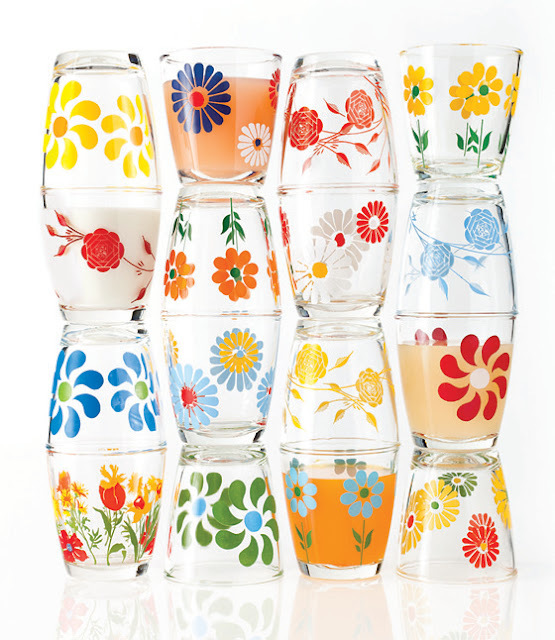 A collection of sour cream glasses from the August issue: bright and sunny. The issues I felt most uninspired by were the spring issues. I was most disappointed by March, the annual gardening issue. It was too earnest, in my opinion, with too much emphasis on vegetables. The Vegetable Garden Primer article was too complex to absorb: too many words, charts, diagrams, lists and boxes. The layout was obstructive to its purpose. The eye simply didn’t know where to go, so the pages were swiftly turned. The article Natural Beauty was also a let-down since it devoted six editorial pages to the promotion of beauty products. One of the reasons I read Martha Stewart Living and avoid Real Simple is to limit my exposure to advertising disguised as content. I did enjoy the article on the community garden. Communities that garden together are happier and healthier, which is an important element to promote. I also liked the Southern Comfort article about the Kentucky garden of Dede McGehee. 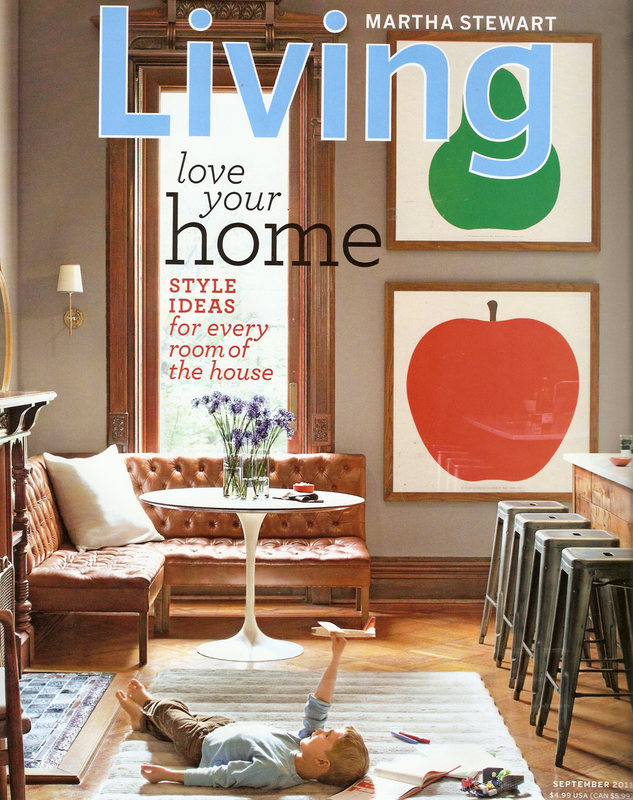 Overall, though, the March issue did not inspire me. As a result, it gets stamped as my least favourite issue of the year. I love this cover of the September issue! I think it is modern with an interesting composition. 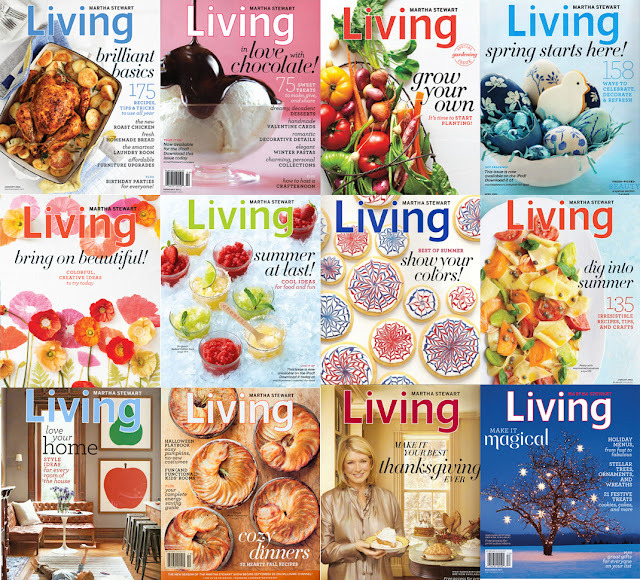 There are so many extraordinary photographs that fill the pages of Martha Stewart Living, month after month: award-winning, inspiring imagery that captures the imagination and pulls you deeper into the stories. They are often the triggers of my curiosity and lure me in to learn more. 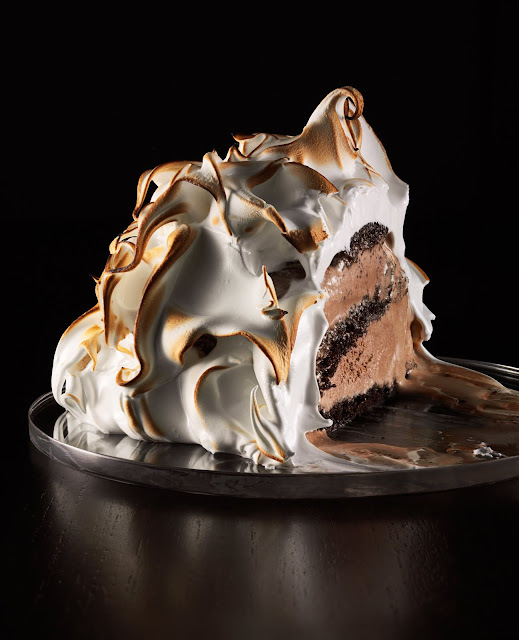 The best photo spread this year, though, has to be the photos of chocolate confections from the February issue, from the article Chocolate, Hot & Cold. Nigel Cox was the photographer. I have him to blame for feeding my eternal obsession with chocolate. The photos capture its luxurious decadence perfectly. I hope you enjoyed this year's review! 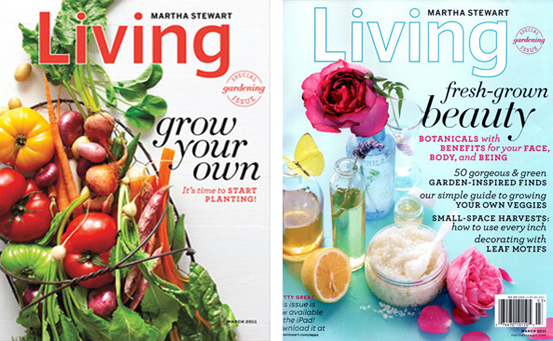 What are your thoughts on the year that was at Martha Stewart Living magazine? Any standout favourites? Anything you felt needed improvement? Andrew, I always look forward to your "Year in Review" posts. Your comments often reflect my own thoughts on various issues. 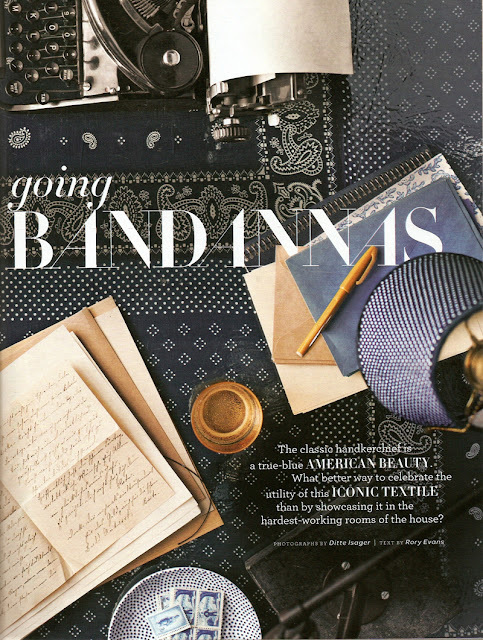 I generally find the December issue to be the most inspiring. It usually sets the tone for my entire Christmas Holiday. However, this year was a bit of a disappointment. Many of the images and ideas were beautiful and well thought out, but something was seriously lacking. The entire issue felt a bit generic, reminiscent of the summer issues with wreaths and lights replacing seashells and tomatoes. While I still subscribe to the magazine in print, the digital issues for the iPad are something to behold. October, with it's wonderful videos and extra content set the bar a bit higher. January hasn't let me down either, the animated, musical cover and the video knitting tutorials are spectacular. Yes, Jason, I really need an iPad! Just like Jason I love your review of this years magazines. I think you are right, the summer issues really were great, but I think November and December were my favourites. Pilar has certainly brought more of a family element back to the magazine and I like it even more than I have done. Last year was a let down. 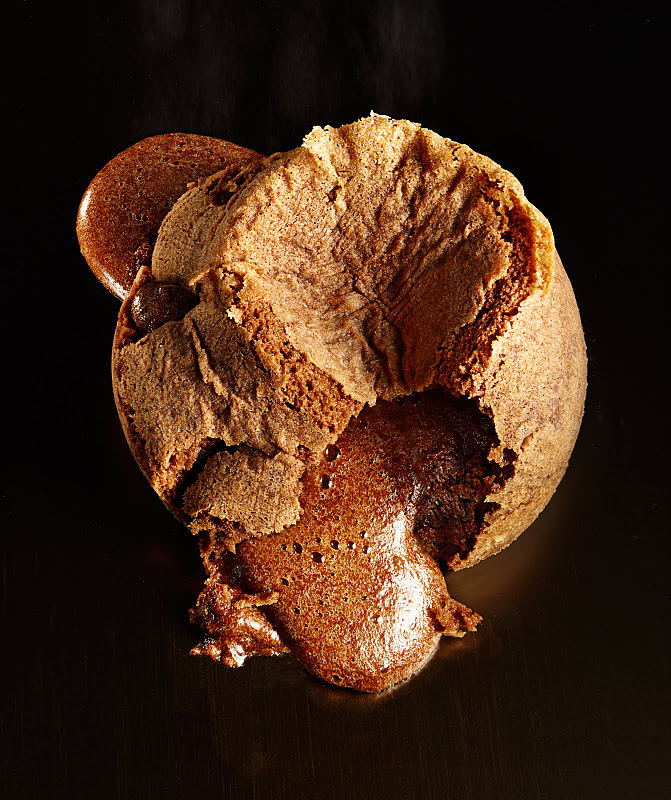 The article on icings was fantastic, and the photography was beautiful. A great round up Andrew. I am sure that 'Martha's Moment' came about because of your blog. I can't wait to see the January issue and the return of Martha's calendar, I was certainly one of those who didn't like the calendar which was featured this year. 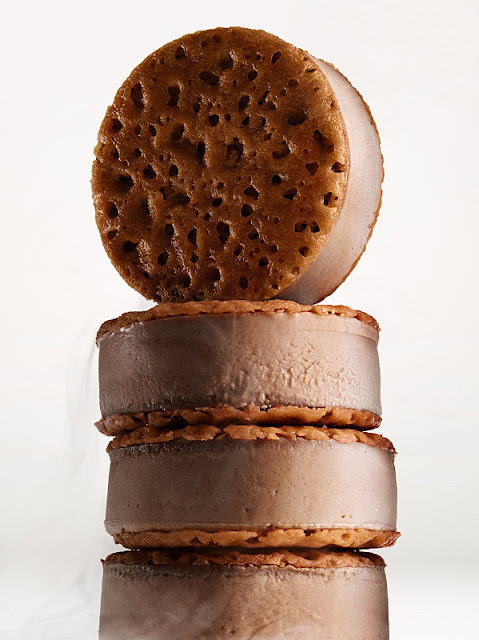 Hi Andrew I always look forward to your interesting and amazing posts this one is really wonderful. I received my signed copy of Martha's new book 2 days before my birthday 17th Dec and it was a wonderful gift. Martha is really wonderful and an inspiration to many people around the world. It is a wish of mine to meet her one day. I want to wish you all the best and success in 2012. Keep up your wonderful posts Andrew. Thank you! Thank you, Rowaida! You're too sweet. Happy Holidays to you as well and a very Happy New Year! The digital issues are amazing and I have to see in print and digital – the chocolate story was one of my favorites also! It was just stunning! the june 2011 is also one of my favorites. the only thing i didn't like about it, though, was the Instant Entertaining feature about Kevin Sharkey's party, in which he served store-bought potato chips, takeout pizza, and a whole tub of store-bought ice cream turned inside out. Maya, I actually liked Kevin's feature because I think it provided a less-intimidating alternative to all that Martha excellence. The point was that you could still have a wonderful party without the focus being on homemade food: you don't have to cook to entertain. It took a lot of pressure off people like me, who actually don't cook! Kevin served his favourites. There was more honesty in that than slaving away on complicated recipes he was not sure he would work out. The way he presented it was gorgeous, also. I'm not a big fan of potato chips, but seeing them in that gorgeous bowl really made me want a handful!